With change and evolution always the constants, our entire team continuously reads books on topics relevant to running an investment management firm. Here you will find some of our best picks for insights on different aspects of the investment industry, marketing and branding, as well as on team management strategies. If you have a book you would recommend, just e-mail us at cr@candr.us. Haven't you always wondered what the competition is like, how they invest money, why certain investors attract so much in assets? Well, here's the story of eight greats: Foster Friess; John Neff; Barr Rosenberg; Bill Sharpe; Mark Mobius; Bill Gross; Gary Brinson; and Peter Bernstein. And even if you ask, "Who is that?" you will find this book a very insightful read. The investor greats run the gamut, from Barr Rosenberg's computer-driven strategies, to Neff's diligent four-principled search for "woebegone" companies, to Gary Brinson's exploiting asset class differences, to Bill Gross' passion for bonds. The book explores their styles, their personalities and their motivations. Covering much more than the accomplishments of the eight luminaries, the book yields a wonderful historical tour of investments. The many "first" stories include the quiet birth of the index fund in July 1971 offered by Wells Fargo and funded by Samsonite Corporation, and Vanguard's own filing for its First Index Investment Trust on New Year's Eve, 1975. Another inaugural story is the launch of The Journal of Portfolio Management in autumn 1974. Peter Bernstein, as the first editor, was reported as chiding investment professionals, academics, clients, and regulators alike for sloppy thinking. The Journal proceeded to deliver theory to investment professionals, creating a whole new frontier of investing and disciplines. We are lightly guided through the arrival of diversification, beta, the Sharpe ratio and various pricing models. For the humanists among our readers, there are quick sketches of the personalities, which frequently parallel the respective investment approaches. The great contrarian, John Neff's mother told him he should be a lawyer because he would argue with a signpost. Barr Rosenberg's father who was a renowned Shakespeare scholar recalled that when Barr began to talk, he talked "very sensibly. He talked about phenomena. About relationships. He'd see one movement and compare it with another kind of movement." Then there's Mark Mobius' heritage. His multicultural upbringing may have been the impetus for his prowess as an Emerging Markets investor. As he says, "being raised in New York by a father from Germany and a mother from Puerto Rico definitely gave me a global view of things." The authors have fun, too, translating investment lingo. For example, "Want to sell a used 1992 BMW? A rational buyer won't pay significantly more or less, than the average price for all similar 1992 BMWs, unless you can prove that Jerry Garcia once took it for a spin. In that case, Jerry would bestow alpha." Almost as valuable as the book for the avid reader is its bibliography, a useful collection of articles and books on our investment industry. Beyond Wall Street, The Art of Investing is a solid educational reference book, putting in perspective the wonderful world of investing. Enjoy! What investment firm is not developing its firm brand in the investment industry? The dinosaurs of tomorrow! But what is a brand, how can it be created, perpetuated and evolved? David Aker's Building Strong Brands provides the novice and the expert alike help with brand building, whether for products or services. Going past "if your firm was a car, what would it be," Building Strong Brands leads you through a branding process, showcases examples, gives direction and, I predict, will be a useful resource book for your own branding endeavors. Aker prefaces the book with his belief that "a brand is a strategic asset that is key to long-term performance and should be so managed." The book tackles five issues key to successful management of that "brand" asset. 1) What brand identity is and how it can be developed; 2) what you need to know to manage the brand identity; 3) what is a brand system (especially useful for multiple product or co-branding issues); 4) how you can measure your brand equity; and 5) "brand-nurturing organizational forms" or once you've got it, what do you do with it. Aker's approach is effective because he presents theory with examples and outlines different models that have been successful for different companies. He has experienced both successes and failures, and is patient in describing the challenges and various solutions different companies have tried. "A key to developing a strong brand identity is to broaden the brand concept to include other dimensions and perspectives." He provides very specific direction to help the practitioner avoid developing a brand with too narrow a focus. Building Strong Brands also cites useful tidbits of market research, wise for you to be aware of when you are developing or expanding your brand. For example, "...an innovative corporate image had a substantial positive impact on corporate credibility, making the firm appear to be more expert (with respect to designing and making the product), more attractive (likeable, prestigious), and more trustworthy. Thus, respondents seemed to be attracted to the innovative profile beyond simply respecting the firm's ability to innovate." The book's behind-the-scenes stories of branding efforts are as informative as the theory and models presented. The combination is what makes Building Strong Brands an indispensable read for anyone involved in the care and development of a firm's brand. Another branding book worth a read if you are in the process of naming your firm or your products is The OmniPowerful Brand by Frank Delano. A what to do and what not to do in the creation of a name. Good luck, and may the best brand win! "There are no dead-end jobs. There are only dead-end people. If you build a network, you will have a bridge to wherever you want to go." A definitive book on building bridges or networking is Harvey Mackay's Dig Your Well Before You're Thirsty. It is motivating, down-to-earth, optimistic, filled with handy hints, wisdom, wonderful anecdotes and all the basics of great networking. As he says, "You can't get anything done - no matter how good your network - unless you understand the process." Harvey leads his readers through the entire networking process, from defining a true network and its value and how to build one, to how to avoid the pitfalls and use your network for productive purposes. He includes a networking report card so you can grade your skills, a question and answer chapter, and some dos and don'ts. For example, "Do try to recognize the differences among people in your network. Ask people who like to be in control for their opinions. Ask team members to help you solve problems." Mackay emphasizes that networking is really about connecting. His tenets stress knowing people, listening to them, helping them. Mackay's maxims constantly encourage you to take the initiative - to meet, learn about and talk to people, to read to find topics to talk about, to organize, to really connect, to follow-through. He believes in the Nike tagline - "Just Do It!" and is generous with suggestions and anecdotes, both his own and those of some other star networkers such as Lou Holtz, Muhammad Ali, Stanley Marcus and most of the presidents of the United States. Most of his book is a constructive guide, outlining numerous benefits from networking. Mackay observes that sharing is the element of networking that slices away layers of bureaucracy and time delays and gets information around as quickly and clearly as possible so it can be acted on by people who know how to use it. His book is beneficial reading for anyone currently with an organization or considering joining an organization. As he says, "Find an outfit to join that recognizes you have something to offer and find out what they can offer you: contacts, exposure, experience. It's all there - in exchange for a little effort." The Top-Ten List of the Biggest Networking Mistakes is very valuable. Mackay asks if the phone is not ringing quite as much as it used to. He then goes on to report that it is because, "They're using E-mail, faxes and the Internet." How right he is! His recommendation to make a genuine effort to modernize skills and knowledge applies to all forms of communications, especially in our industry. His number ten biggest mistake is one we all know, but forget - "If you don't know, ask. Even if you do know, ask." Harvey Mackay clearly follows his own advice: he closes the book with his address and e-mail, and invites the reader to connect with him. When you finish the book, you feel like you are just starting on a great adventure with a wonderful, amusing and experienced guide, a person you can network with! The crash and burn of Long-Term Capital Management, its massive leverage and the punishing impact on the equity markets made me realize how little I knew about hedge funds. I had a lot of questions, and this is the book with a lot of answers - a must-have resource book. Ron Lake has collected the wisdom and experience of hedge fund investors and managers. Having the different managers cover the spectrum of hedge fund styles - ranging from value and event investing to market neutral and short selling investing, revealed that all hedge funds are not alike! Learning about different investors' strategies is insightful, including comments from both the institutional and private investor perspectives. The section on assessing risk and risk control is helpful, especially in understanding what type of control, review and operating procedures should be in place. The final section of the book deals with performance measurement, benchmarks and how to evaluate hedge funds. All in all, a delicious, informative tour of the world of hedge funds. Editor's Note: Ron Lake is President of Lake Partners, Inc., an investment consulting firm located in Greenwich, Connecticut. Lake Partners advises wealthy individuals and private investment companies on asset allocation, manager selection and program supervision. Lake has been working on a forthcoming second edition to "evaluating and Implementing Hedge Fund Strategies." Jim Harris, Ph.D., Joan Brannick Ph.D.
Perhaps the greatest challenge for any industry is to attract top talent, keep that talent and ensure that employees are working to their potential. The most effective business plans are only ideas without the right talent working as a cohesive unit to implement them. Although low unemployment and fierce competition compounds the difficulty of finding outstanding individuals, Jim Harris, Ph.D. and Joan Brannick, Ph.D. point out in their book, Finding and Keeping Great Employees, that the problem is often that a firm has not identified and defined its own culture. Using effective examples, Harris and Brannick focus on people; corporate culture; and a strategic more than tactical approach to finding and keeping great employees. They highlight that the most successful organizations in staffing and retention practices are those that leverage their core culture to attract and retain like-valued employees. The authors begin by identifying the most common reasons for employees becoming disconnected from their firms. Employees disconnect on three levels: company, job and personal. Perhaps the most tenuous balance exists between the employees' personal and professional lives. 1 The organization must clearly understand how each core culture uniquely contributes to employee connectedness. 2 The organization must embrace one core culture as its operational driver. 3 Management must then align all staffing and retention strategies to the core culture. Harris and Brannick identify four broad corporate cultures: customer service, innovation, operational excellence and spirit. A customer service-oriented culture embodies key values such as taking a proactive rather than reactive approach to serving clients, and going above and beyond in terms of service. Innovation cultures focus on a need for speed; cannibalization and creative destruction. They give employees the power to control their own destinies, and then get out of the way. Operational excellence is defined as the ability of a firm to maximize production efficiency, with each employee working within a system of designated boundaries. Spiritual orientation involves companies that align their cultures with involvement in social, political or religious pursuits, all in an effort to work for the greater good. Reading this section, I am reminded how unique our industry is in that it is a combination of all four of these corporate cultures that propels most investment management and consultant firms to success. 1 Create a "WOW" factor by stepping out from the growing crowds of look alike firms. 2 Treat every applicant the same as you would a client - know what you want in an applicant, and make the process pleasant. 3 Get Real - be honest and upfront with applicants about the strengths and weaknesses of the firm. 4 Do not wait for a job opening to occur - keep your eyes and ears open for quality candidates and when you find a match, hire them regardless of whether there is a specific job. The authors note that to have a fully aligned staffing function, you must measure what you currently do and use that information to revise and improve. Measurement is the key for keeping and improving staffing practices that consistently attract culturally aligned top talent. 1 Engage the soul - create compelling reasons for employees to commit their hearts and souls to something beyond their task lists. 2 Reward employees for a job well done. 3 Encourage your employees to lead well-rounded lives. 4 The greater employees are free to be themselves, the greater the retention. Harris and Brannick suggest that an effective way to define your firm's core culture is to obtain employee feedback from all levels of the organization. Once you have clearly defined your companies' core culture, prioritize your alignment initiatives, implement them and monitor their success. Finding & Keeping Great Employees is an empowering blue print for both employers and employees. The authors afford employers a strategic outline for hiring and retaining talent, while reminding prospective employees of the many issues beyond career development and paychecks when it comes to choosing a place of employment. I recommend this thesis to professionals at all levels as a quick reference guide for beginning a hiring initiative, for the numerous, interesting examples of practices from other firms and for strategies to identify and unlock the top talent you already employ. I know what you're thinking. Just what are the world's greatest managers doing that sets them apart from the pack? To answer this question, the Gallup Organization conducted a study, interviewing over 80,000 managers in over 400 companies. Their answers are not surprising...just unconventional. Everyone is talented. And every role, from bookkeeper to housekeeper to CEO, requires talent. Talent, different from skills or knowledge, is the most important quality to consider when selecting members for your team. You can teach skills and knowledge, but talent is innate. Talent is a passion, an instinctive ability. Passion is what drives and motivates people to do their best every day. Talent is more important than the conventional views of experience, brainpower and willpower. "The key to excellent performance is finding the match between your talents and your role." Another point brought forth is that people don't change that much, so don't try to put in what was left out. Try to draw out what was left in, which are their talents. Excellent managers help members of their teams find their hidden talents and teach them the knowledge and skills that leverage those talents. Look beyond titles and job descriptions for what roles really require to determine if employees are in their best suited positions. Also look to your best employees as the standard setters. Focus on successes, which are better guides for future performance and morale, rather than focusing on negative experiences or failures. Managers can't force things to happen. You can't successfully mold your employees by having each one complete a task the same way. Managers can only influence employees, and the tactics by which they do so determine their employees' reactions. Since managers are accountable for their teams' performance, they need to focus their teams on achieving desired outcomes. Motivating and inspiring employees to choose their own paths capitalizes on their talents. The authors share their observation that as long as a teacher's students are performing well, principals need not waste time monitoring in-classroom actions. The key is trust, and trusting your employees nurtures self-awareness and self-reliance. By defining the right outcomes, such as what is right for the client, the company and the individual, you will know how to measure performance. You will be able to trust your employees to reach the end result by their own means and through their own talents. Build on strengths, not on weaknesses. Release your team's hidden talents and build on the apparent. Many managers try to fix weaknesses. The authors recommend managing around weaknesses, such as buying a Rolodex for a person who doesn't naturally remember names. A common misconception is that each person must have all the talents required to perform a role. Not all people have the same potential. The best managers build a well-rounded team whose talents complement one another. Managers often focus on areas for improvement, rather than where employees exhibit strength. Sit down with your employees and set goals with them. Meet with them often. Meet with the best members of your team as they often fall by the wayside. Manage by exception and play favorites. Don't treat everyone the same way. By finding out what makes a person tick, how they like being treated and what motivates them, managers can determine what drives each employee and use that to everyone's advantage. Success occurs when people do the jobs they love. Employees start in a role with the hopes of growth, including responsibilities, compensation and prestige. The best managers don't promote people into levels of incompetence, which will only lead to frustration and disappointment; instead they focus their employees on a career path that highlights and promotes their talents, for the benefit of both the individual and the firm. They look at a person's talents and how they compare to those needed for a role. They never assume all people have all the talents needed to succeed in a position. By making a hero out of every role, you can have a range of expertise in a certain area which leads to achievement and employee satisfaction. First, Break All the Rules is a great read for managers and non-managers alike. Since one of the book's primary suggestions is NOT to follow conventional wisdom, many employees may be confused by actions their managers take as a result of the book's direction. 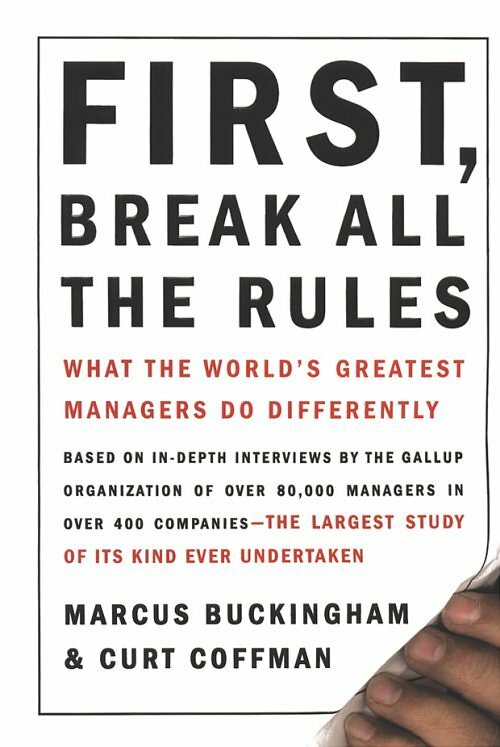 Digesting the concepts of First, Break All the Rules gives you an in-depth understanding of a manager's motives for being unconventional, and the success that results from their actions. Go ahead - break the rules. I dare you! What can a fishmonger's and a corporate supervisor's business strategies for boosting morale have in common? Plenty! Fish! is an inspiring story filled with business and life lessons that can help you become a better manager, employee, person. Fish! is a lighthearted tale of Mary Jane Ramirez, a supervisor facing a daunting task - motivating and energizing a reluctant, burned-out team she inherits through a promotion; a group fondly known as a "toxic waste dump" by her firm, First Guarantee Financial. Fish! opens with a foreword by Ken Blanchard proposing the simple principle on which most professionals operate today, the need to do work that we love. The commitments and constraints of the fast-paced, high-pressure world in which we live, however, can make finding work we truly love seem unattainable at times. The quick-reading story is woven around four simple principles that will allow you to create a satisfying environment for yourself and your team members, and transform a mere job into a career you love. Back in Seattle, on a lunchtime trip to the Pike Place Fish market, Mary Jane stumbles upon a new friend and a new way of thinking, in fishmonger, Lonnie. He teaches Mary Jane an unconventional approach to creating a satisfying workplace that can be applied in any business, from a fish market to a financial institution. The inspirations employed by Lonnie's fellow fishmongers in the Pike Place market brought energy to their workplace and transformed a cold, damp, dreary job into a world-famous market with motivated employees who truly enjoy their work. Mary Jane soon realizes that she and her team at First Guarantee have a lot to learn from the secrets of the Pike Place Fish market. Fish's secrets for unlocking a team's passion and excitement for their work are straightforward and easily applied. We have the power to let our attitude influence our environment, rather than letting our environment influence our attitude. The authors, Stephen Lundin, Harry Paul and John Christensen, pose the question: If any job can be unsatisfying (to the person doing the work), can't any job be done with energy and enthusiasm? There is a simple, yet critical answer: There is always a choice about the way we do our work, even if there is not a choice about the work itself. Realizing that she has adopted a less-than-stellar attitude herself, Mary Jane makes that choice, and returns to her downcast team the next day with a strong, positive attitude. Yes, it IS work; but, why can't work be fun? Lonnie and the other team members of the Pike Place Fish market enjoy their environment, and enjoy the time they spend with their customers. They send fish sailing through the air, they tell jokes and fill the air with the unmistakable energy of PLAY, all the while meeting their clients' needs. By choosing their attitude and enjoying play at work, Lonnie and his fellow fishmongers have become most valuable players on a winning world-class team. Now, ask yourself and your team, how can we play and create more energy in our environment? Imagine the power of engaging and creating memories for your clients. That is just the lesson taught by the Pike Place Fish market, a lesson that Mary Jane learns with the help of her children. On a Saturday afternoon, Lonnie treats Mary Jane's children to the experience of their young lives - being involved members of the fish market team. Lonnie made their day. Finding creative, respectful ways to involve their customers in the sales process, and engaging them with the high-energy of the team members, the market's customers walk away satisfied and with fond memories of their experiences at the market, compelled to return. Find someone who needs a helping hand, a word of support, or a good ear - and make their day. Working to make your client's day directs your attention towards the client, and ensures your focus on their needs. Employees at the Pike Place Fish market are always searching the crowd for their next customer, always looking for the next opportunity to act. In Be Present! you learn to be aware of your surroundings and needs of those around you. This tip is applied not only in serving clients, but in approaching them as well. To keep the positive energy high when approaching your own internal clients, ask the simple question - "Is now a good time?" "Are you present?" The final valuable reminder the authors share is in the application of the Fish! philosophy - let your team discover the Fish! philosophy for themselves. Don't just tell them, let them learn how to internalize the teachings and apply them in their own style. Chose your attitude and motivate your team by example. As Yogi Berra says, "[Your team] can observe a lot by watching." Choose to make today a great day! History is seldom boring, sometimes fascinating and always instructive. Case in point - Michael Clowes' latest book on our institutional investment industry. His report on pension funds revolutionizing investing begins with the optimistic tale of U.S. initiative at its best - laws and reforms as early as 1948 setting the stage for massive pension asset flows into sophisticated investment strategies, thus benefiting U.S. workers, capital markets, real estate development, public and private companies and adroit entrepreneurs everywhere. We all owe a great round of applause to the federal judge mandate that steelworkers could negotiate retirement benefits with labor bosses, thus midwifing the birth of defined benefit plans and a flood of capital. Amazingly, one man, Anders Voorhees, chairman of the finance committee for U.S. Steel, concerned that bonds would not cover future obligations, persuaded his committee of the logic and appeal of investing in equities. Those first brave plan sponsors who set precedent for the equity allocations we all take for granted changed the U.S. economy and our lives forever. The first defined benefit plan, first independent investment manager for a pension plan, first actuarial evaluation, first search consultant, first foray into real estate, international investing, index investing and venture capitalï¿½Michael's book reads like a Hall of Fame for Institutional Investing. It's fun to read that the State of Oregon hired its first outside equity managers in 1969, Capital Guardian Trust, Transamerica Investment Counselors and Fayez Sarofim & Co. I couldn't help but wonder what database Oregon used and whether they sent rfps and if they did, to how many managers? I loved learning about the starts of Jennison Associates, Russell, Greenwich, Evaluation Associates; Andy Carter noted as the father of active bond management - and Capital Group starting international investing; and the emergence of that powerhouse investment strategy - indexing! What heady times. I laughed out loud to learn that P&I created a stir by publishing performance of the top 21 banks. People didn't report performance way back then! Then the everyone-blissful-in-never-before-seen-creativity-productivity-and-prosperity tale turns dark. The recession, beginning in 1972, coupled with the bear market of 1973-1974, decimated returns and aspirations. Pension reforms and initiatives trailed the wake of the 73-74 markets of woe, and legislators surprised everyone by actually passing a bill. As Michael quoted one unidentified lawmaker, "This bill will do something to someone, but we aren't sure what and to whom." No wonder he remained unidentified. ERISA became law in 1974 and pension assets totaled $115 billion. The following year, 5000 pension plan terminations occurred in the first nine months alone. Pioneers oblivious of the signal of malaise forged ahead. Michael outlines innovation after innovation from 1975 to present, some successes, some debacles, but all interesting. He writes, "Through their pioneering activities in all aspects of the capital markets, these institutions changed investing for all investors." And so they did. Through collective efforts of wonderfully creative and mostly thoughtful professionals, we now have the incredibly varied, challenging and rewarding institutional investment industry of today. An industry that witnessed the nation's total pension assets reach $8.7 trillion in 1998, and now exceeding $10 trillion. Like a great novel, The Money Flood builds in suspense. Michael unveils actions of politicians and government bodies bursting with good intentions. With the charge of controlling tax revenue leakage, the Treasury Department, the Internal Revenue Service and Congress rushed to produce more laws and restrictions. I can't give away the ending - but as Peter Bernstein writes more eloquently than I, "The far-reaching consequences of these changes make this authoritative and lively book must-reading for everyone." I will ask a question, though. Before the ark is stranded on dry land, will all those wonderfully creative, mostly thoughtful professionals lead us again into new eras of productivity and prosperity? Has your team ever failed to accomplish an objective, meet a deadline, or work as cohesively as you would like? Team leader or member of a team, here's an excellent workbook on team conditioning! Susan Nash defines a great working team, how to measure your team and recommendations for problem areas. Susan provides exercises for understanding differences in likely behavior/needs. Interesting case studies demonstrate how teams can benefit from having members from each temperament category. The next chapter elaborates on how the different categories assess information, make decisions and reach conclusions. The first chapters give sufficient knowledge of individual differences to begin tackling the real issue of teamwork - making individual differences work for, not against you. A table outlining barriers to great team performance serves as a useful reminder of the many challenges to effective teamwork, such as cultural values; individual approach; different styles; politics (business); lack of strategic direction; lack of clear performance goals; and no training. (I would add time and technology!) Even more useful are the characteristics of high-performing teams addressed in subsequent chapters - defined strategy, clear roles and responsibilities; open communication, rapid response and effective leadership. Once you identify your problem areas, you can skip to the chapters focused on those areas. I confess I skipped to effective leadership and returned later to others clamoring for my attention. I was relieved to read she didn't exclude my type from leadership! I agreed with her, leadership rotates depending on the task at hand, and the team will ultimately practice equal or shared leadership. The chapter on leadership gives team members insights into their leaders and is also beneficial for leaders-in-the-making. Her chapter on open communication traverses the obvious - sending an e-mail without a reply is not communicating to the high risk - samples of peak levels of communication and ways to achieve productive communication. If what Henry Ford said is true, "Coming together is a beginning; keeping together is progress; working together is success," then this book can be an essential tool for success. The book can be an effective foundation for a six-month team development program. The entire group could read it, measure the team's strengths/weaknesses, and conduct working sessions on the relevant chapters. Notes: At Charnley & Røstvold, we rely on the Birkman to understand skills, aptitudes, productive behavior and needs, and use external consultants such as Claire Carrison, 803.432.7129 and Ginni Corsi, GinCorsi@aol.com, as guides in our evolution as a High Performance Team. We also have benefited from Robert Jones, 716.662.3439, an MBTI professional who coached us to new heights. Turning Team Performance Inside Out reinforces the principles Bob introduced to us. Other interesting books on teamwork include: Teams at the Top by Jon R. Katzenbach; Flight of the Buffalo, Soaring to Excellence by James A. Belasco and Ralph C. Stayer; and Co-Leaders by David A. Heenan and Warren Bennis. A truly fascinating read is Nicholas Dunbar's new book, Inventing Money, the Story of Long-Term Capital Management and the Legends Behind It. Dunbar is a wonderfully instructive writer on the conglomeration of mathematics, finance, greed, technology and egos that rocked the worlds capital markets in 1998. Published by John Wiley & Sons Ltd., available through e-mail: cs-books@wiley.co.uk. Personal wealth can be a blessing or the bane of one's existence. In Wealthy & Wise, Heidi Steiger of Neuberger Berman, brings together a host of experts in the field of wealth management to provide advice for enjoying the opportunities and avoiding the pitfalls associated with personal wealth. As more money management firms expand their reach by serving high net worth investors, this book gives an ideal glimpse into the goals, concerns and questions of the high net worth individual. Whether you aspire to build your own personal wealth, or work with wealthy individuals and families, you will find a plethora of valuable insights in this book. The book addresses three distinct areas - The Dynamics of Wealth, Managing Your Wealth, and Private Lives. Part One, The Dynamics of Wealth, deals with the psychological issues - balancing emotions and objectivity. The authors define steps for resolving conflicts in family enterprises and maintaining family harmony, such as hosting regular family meetings, as well as describe the many new options for charitable giving, such as Charitable Remainder Trusts and Donor-Advised Funds. In Chapter 1, Susan Remmer Rysewic encourages writing a personal mission statement as a tool for confronting the emotional hurdles of wealth and for guiding decision-making. Part Two, Managing Your Wealth, serves as "Investments 101" for the reader, with guidelines on a range of topics including: determining the appropriate asset allocation; building a team of family wealth advisors; or establishing a family office. The experts reinforce the importance of seeking professional advice from a variety of professionals to understand the distinct complexities of investing and maximize the potential and benefits of family wealth. You will find wealth management strategies for a spectrum of investor types as well as useful statistics on investor preferences for communications and sample manager and portfolio structures. Ralph D. Sinsheimer's chapter on prudent investment includes a sample investment policy for a family foundation. Part Three, Private Lives, offers a glimpse into the joys and responsibilities of wealth. Chapters in this section cover the "Joy of Collecting" to express one's personal interests, practical advice for purchasing and enjoying luxuries like planes, vacation homes, or boats, and staying "Safe and Sound" by developing a sensible strategy for your personal security. The format of Wealthy & Wise makes it easy to find topics of interest with descriptive chapter titles, and highlights and tips neatly summarized in "Words to the Wise" boxes at the end of each chapter. Several chapters begin with personal stories, anecdotes or situations that bring the challenges and opportunities associated with personal wealth to life. You will find this book both informative and inspirational. Two chapters on the value of work remind us how to examine ourselves and work towards our goals. Roy Neuberger's passage instills new energy and a passion for creating value in our lives and work. Mr. Neuberger encourages the reader to "Stay curious. Greet every morning with enthusiasm, know that each day you will learn something new." Practicing what he preaches, Mr. Neuberger, at 99 years old, spends a good part of every workday in his office at Neuberger Berman pursuing his passion, investing.